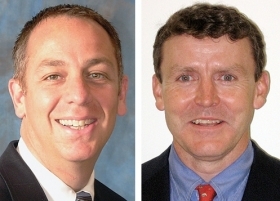 Vince Santivasi, left, vice president at Zurich's Direct Markets unit, and Bill O'Flanagan, head of Reedman Toll Auto World, will speak on "Bringing a System to F&I Madness" on June 21. Most dealerships have a system for selling cars. Many don't apply a similar plan to F&I. Vince Santivasi, a vice president at Zurich's Direct Markets unit, believes F&I departments that fail to adopt a "front-end" approach may be losing sales opportunities and irking time-sensitive customers. He will outline his strategy in a session called "Bringing a System to F&I Madness" during Automotive News F&I Week -- a free, online conference -- on June 21. Santivasi will explain how effective F&I begins with a properly structured deal on the car itself. He will then spell out ways to build trust, reduce the risk of legal exposure, and increase the amount of time for presenting products that fit customers' needs. He will be joined by dealer Bill O'Flanagan, president of Reedman Toll Auto World in Langhorne, Pa. O'Flanagan also owns a Chevrolet store in Springfield, Pa. In sharing some of his best practices for closing a deal, O'Flanagan will explain why his stores put so much emphasis on extended-service contracts. It's all part of a holistic approach to F&I that stretches from cashiers to service advisers. O'Flanagan is a former New York City prosecutor who joined Reedman Toll eight years ago. Santivasi has held a variety of finance and insurance posts at Zurich. He joined the company nine years ago after a career in auto retailing. "Bringing a System to F&I Madness" will be held at 1 p.m. EDT on the third day of F&I Week. The June 19-21 event will feature six live Webinars that can also be accessed after the event on demand. The conference can be attended right from your computer. It's geared for F&I managers, dealer principals, general managers, sales managers and anyone who wants a deeper understanding of finance and insurance. To find out more about F&I Week or to register, go to fandiweek.com.